Capgemini Off Campus 2019: Freshers who are looking to work with MNC IT company like Capgemini has good news. Capgemini has released an official advertisement for the Capgemini Off Campus Drive for 2017 and 2018 Batch. B.E/ B.Tech and MCA Freshers of 2017 and 2018 batch can use this great opportunity. First, candidates have to complete the Capgemini registration process using the link below. Also, don't forget to complete your registration before the last date(January 13, 2019). We already knew that Capgemini is one of the top MNC IT company in the world. It has global delivery centers across various locations in India. Selected candidates in the recruitment drive are ready to relocate anywhere in India. Let's have a look into more details of Capgemini Off Campus Drive 2019. Capgemini has over 1 lakh employees working across India like Chennai, Hyderabad, Mumbai, Pune, Bangalore, NCR, and Kolkata. Recently Capgemini has acquired IGATE and other companies to become one of the strongest IT giant globally. If your dream is to work in an MNC company like Capgemini, Then start applying for it. 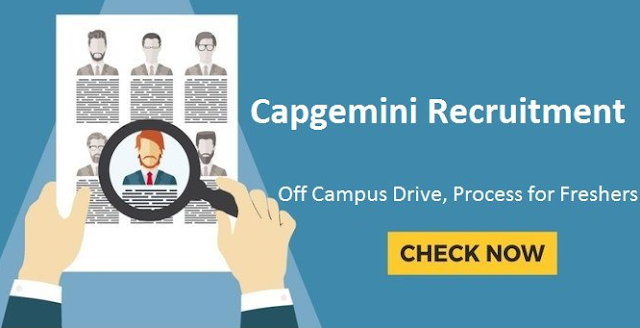 Let's have a look into the Capgemini Off Campus Drive for 2018 Batch details. The Capgemini Off Campus Drive for 2017, 2018, and 2019 Batch selection process contains the following levels in Interview. The first level is Aptitude Test followed by a Written Communication Test. In the Aptitude Test, questions are from Analytical and Quantitative topics. Qualifying candidates in the First round of Interview are required to attend the Coding Round which contains questions on programming concepts like Data Structures and Algorithm. Upon qualifying second round, Candidates are eligible for Technical Interview followed by HR interview. Interested candidates have to first check the eligibility criteria for the Capgemini Off Campus Drive 2019. If you are satisfied with the Capgemini Eligibility Criteria, then complete your online registration. Candidates should have 60% or CGPA equivalent to 60% and above in academics in 10th, 12th or Diploma. Engineering Graduation aggregate should be minimum of 50% or equivalent CGPA. Engineering Should be from any of the discipline– Information Technology, Information Science, Computer Science, Computer, Electronics, Electronics & Communication, Electronics & Telecommunication, Electrical & Electronics, Electrical, Electronics & Instrumentation, and Instrumentation. Candidates must have excellent English language written/spoken communication skills. Candidates who are selected in the Capgemini Off Campus Drive for 2017, 2018 and 2019 Batch, sign a service agreement for two years from the date of joining. Willing to relocate any place in India Mumbai/ Pune/ Bangalore/ Chennai/ Hyderabad/ NCR / Kolkata. Flexible to work in rotational shifts. Apply before the last date 3rd March 2019.